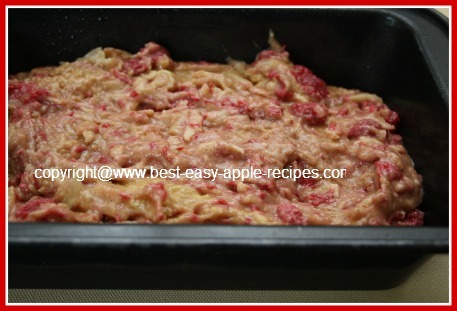 This Raspberry Apple Bread Recipe turned out excellent! 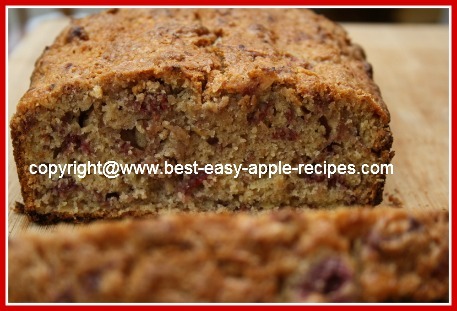 I made this healthy apple quick bread yesterday, and it didn't last the day...it was good to the last crumb! 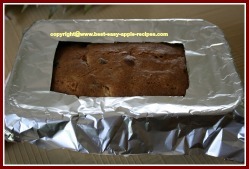 If you are looking for a recipe to make an apple loaf that is moist and delicious, you have found an amazing recipe here. It's quick and easy too! 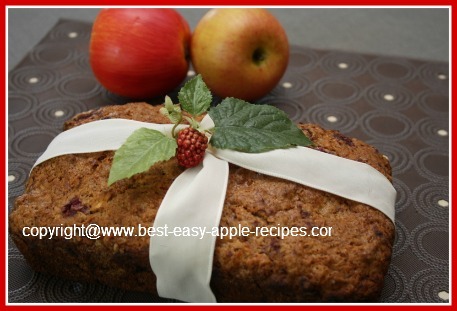 This is an apple quick-bread, meaning no rising time necessary - no yeast! Whisk together the flour, baking powder and the cinnamon in a large bowl. In a small mixing bowl, combine the lightly beaten eggs, the oil and the vanilla. Core the apples, and peel apples if desired (I left the peel on, I find it adds texture, colour...and the peel is healthy). Then grate the apples. Add the egg mixture to the flour mixture, and stir in the grated apples. Gently, using a wooden spatula, fold in the raspberries, and stir just until moistened. Do not over-mix, or else the finished bread will have a "tough" texture. Transfer the batter to a greased, (I used non-stick cooking spray), 5" x 8" loaf pan. Bake at 350° F for about 1 hour, or until a toothpick inserted in the center comes out clean. Remove bread from oven, and allow it to cool for about 10 minutes, then remove the bread, and allow it to continue to cool on a wire rack. Slice, and serve plain, or with butter and/or raspberry jam or a fruit spread of your choice. Yields about 8 - 10 slice servings. If you notice that the edges of the apple loaf are beginning to get too dark, you can make a homemade shield out of aluminum foil, similar to the pie crust shield. I added this shield to the apple bread loaf after about the first 40 minutes of baking time. Did you know that it is healthier to include the peel when eating apple, or when baking or cooking with apples? Apples are a good source of flavonoids, which have antioxidant properties. Raspberries also contain a lot of antioxidant activity. 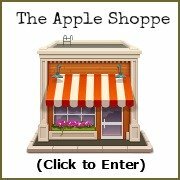 It is believed that most of this compound in apples is found in the peel. 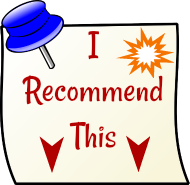 Antioxidants are important to help the body prevent and repair oxidative stress, or harmful free radicals. Although our bodies produce antioxidants naturally, as one ages this process is not as effective. Eating or baking and cooking with foods high in antioxidant activity, such as apples and berries is a healthy addition to all diets! 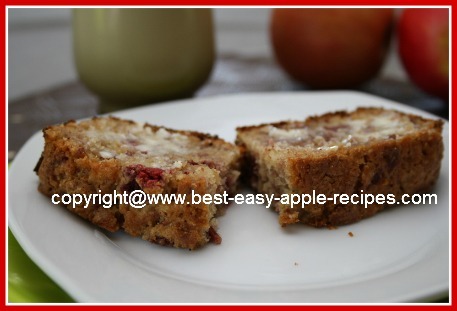 This recipe for a healthy loaf of raspberry apple bread is a good idea for a recipe high in fruits known for their high level of antioxidant activity. Also, eating apples with the peel helps to add more natural fiber to your food, a benefit to the digestive tract.